We’ve come to the end of another week and with that comes a nice batch of new game releases to enjoy over the holiday weekend. First up this week is the latest offering from NimbleBit. Capitals is a turn-based word battling game where two players put their wordsmithing skills to the test as they battle for control of the hex-based board. Select letters from anywhere on the game board to build words and capture/unlock new tiles to expand your reach toward the other player, (hopefully) eventually capturing their castle and then the entire board. 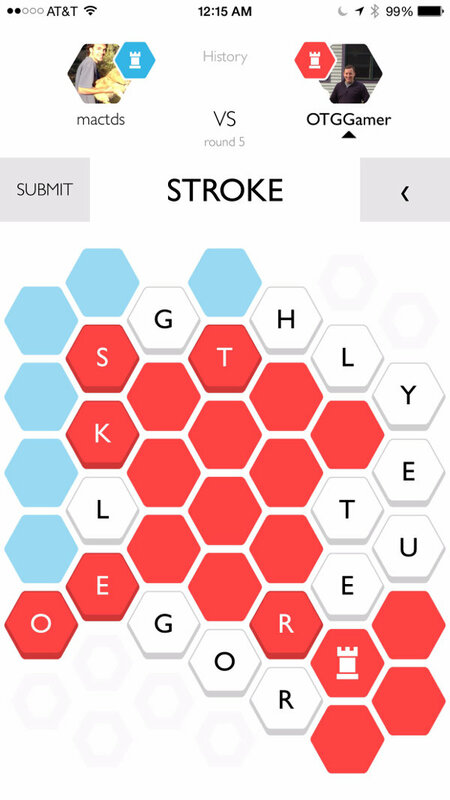 It is a fun freebie in a similar vein as Letterpress, but with even more of a strategy game feel. If you are someone who was on the fence or may have passed on Kieffer Bros’ paid release of Blockwick 2 due to cost, I have some great news for you. They’ve just released Blockwick 2 Basics, a free, ad-supported iteration of Blockwick 2 with 144 unique, easy puzzles and nearly all of the specialty blocks found in the premium experience. Now there is no excuse not to check out this great sliding block puzzle game for yourself. Noodlecake Studios also returns this week with Brickies, a neat breakout style game with some unique changes to the gameplay. 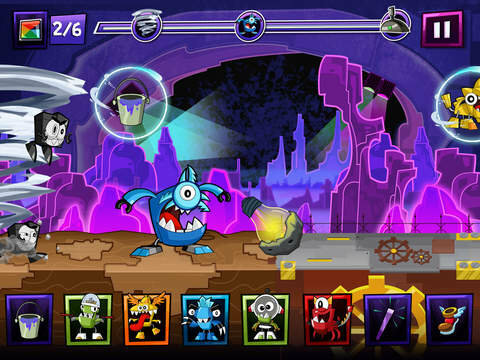 First off, the player has two paddles one at the top, one at the bottom of the screen and all of the breakables are in the center. A varied block setup and cool collection of power ups keep things interesting, offering the player multiple balls, flaming balls, spinning sawblade balls and more. However, probably the most unusual aspect is the fact that you don’t ‘die’ if you miss striking the ball, it simply deactivates and wont break bricks until you hit it again with one of your paddles. Since you are playing against a clock and must complete levels within a certain amount of time, this one little tweak can be detrimental. 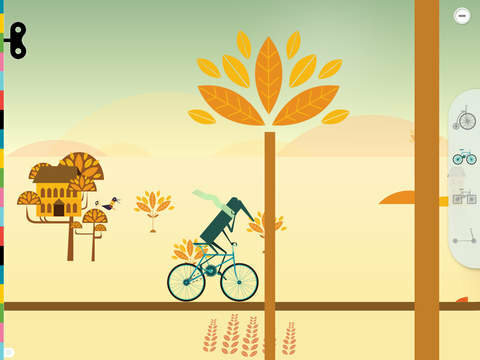 With its clean art style and innovative play, Brickies is definitely worth a look. From Chillingo this week, we get The Top Spot, a new casual puzzle game with a little dexterity element thrown in for good measure. 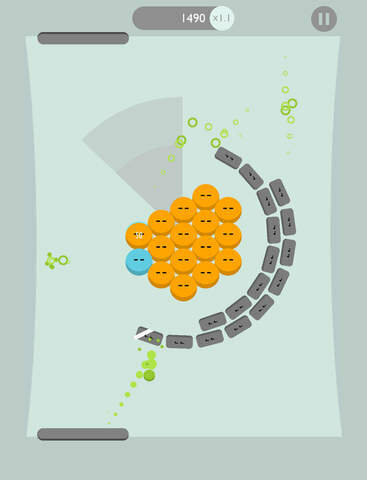 Players must tap the colorful circles in order from the topmost to the bottom-most as quickly as possible. The catch is that these spots are constantly moving, which allows the player to determine which is on a higher plane compared to the others (when their paths cross), but also it means it is easier to make a mistake and accidentally tap the wrong thing. 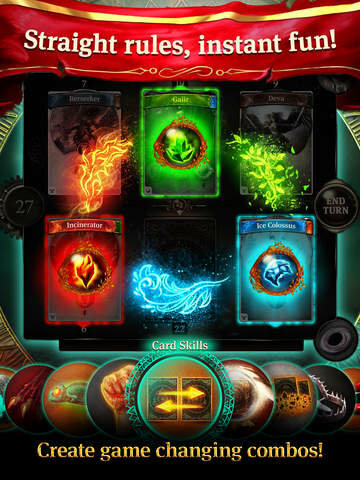 Earthcore: Shattered Elements is a new free tactical card battling game from independent mobile games developer, Tequila Games. The battlefield is split into two sides, with three columns. Taking on the role of elemental lords, players battle for supremacy by taking turns playing cards (units) to the empty slots on the battlefield. Cards belong to one of three elements (Earth, Wind and Fire) and once all slots have been filled the round is over and the battle is resolved utilizing a rock-paper-scissors mechanic of ‘water extinguishes fire’, ‘fire burns earth’ and ‘earth absorbs water’. Despite the simplicity of the RPS component, the game seems to have some room for strategy, especially in the way damage is dealt and a risk mechanic in which “players gamble their health points while playing stronger cards”, plus there is a whole crafting mechanic which I haven’t even had a chance to explore yet. Earthcore contains both a single-player campaign as well several multiplayer modes and some well-produced video tutorials to get you up and running. This next release is not really my cup of tea, but if you have Ice Age fans at home, and/or are not entirely burnt out on match-three games yet, then Gameloft has just released Ice Age Avalanche. AstroTails : Escape the Sun is a cute, family-friendly logic puzzle game in which you are trying to transport animals from the Sun (which is way too hot) to a rescue ship. The problem is that the transport ship only holds a limited number of animals at a time and certain animals refuse to travel with one another so you must figure out how best to transport them all to safety given and increasingly complex set of guidelines. A cute presentation and a fun way to introduce concepts of logical thinking and puzzle solving to kids. The new retro action platformer, Sword Of Xolan was one of this week’s pleasant surprises for me, I’ve really been enjoying it. You play as a young knight named Xolan and in each of the game’s 30 levels you are trying to safely reach the exit while rescuing three (sometimes) hidden people as well as finding a treasure. For controls (all customizable) you have left and right arrows for movement as well as an attack button for your sword, jump button for single and double jumps and another attack button for your (limited ammo) projectile weapon. Sword Of Xolan offers some nice level design with branching pathways, allowing the player room to explore for the hidden prisoners, but the levels are not overly big and boring (a complaint I had with Ravenous Games’ Random Heroes series). The combat is fairly simple, but works well in the context of this retro platformer. I’ve already mentioned AstroTails, but here are a few more titles that are perfect for the little ones in your home. Once again integrating STEM learning principles into an edu-tainment app, Tinybop has released Simple Machines by Tinybop. Utilizing a selection of six simple machines, the app introduces kids to basic physics concepts including “force and motion, actions and reactions, inputs and outputs, conservation of energy, mechanical advantages, and tradeoffs”. Kids have fun, using their imaginations while experimenting with levers, wheels and axles, screws, pulleys, inclined planes and wedges. Whether they are using a lever to destroy a castle or making music with inclined planes, your children can make changes and immediately see their effects. A neat dragging x-ray tool can be slid across the screen to see the various components of the machines and get a better understanding of how they work. My older daughter loved Tinybop’s The Robot Factory, so I suspect she’ll enjoy this one as well. Keeping on the edu-tainment kick, we have Mystery Word Town, the latest offering from Mystery Math Town developer Artgig Studio. Aimed at children aged 6 to 12, kids practice their sight word spelling while helping sheriff (a cute little ghost) catch outlaws and recover some missing gold. A variety of selectable skill levels and two different game modes allow you to tailor the experience to your particular child’s skill level. Like its predecessor, Mystery Math Town, looks like an appealing kid-safe production. In March of last year, Cartoon Network teamed with LEGO® to release Calling All Mixels, a real-time strategy game based on LEGO’s Mixels property. Now they are back with another Mixels title, Mixels Rush. Major Nixel has unleashed a Nixelstorm of epic proportions and in order to stay ahead of the storm, players must mix various Mixels to unlocking their more powerful, newly combined abilities to beat the Nixels and continue moving forward. Combining three Mixels from the same tribe unleashes an unstoppable Max. Other than playing some of the original Calling All Mixels game, I must confess that I am not very familiar with this particular LEGO property (my girls are all about the Lego Friends and Elves). If your child is into Mixels, then this could be a fun one to pick up, Cartoon Network usually does a nice job and it’s got some nice colorful cartoony artwork. 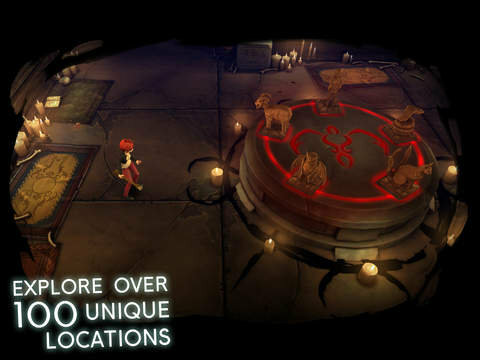 Originally slated as a fire phone exclusive, this week we get Amazon Game Studios’ second iOS game, Til Morning’s Light. After the death or her mother Erica Page moved to a boring New England town with her father. She eventually strikes up a friendship with fellow social outcast Angie, who she discovers likes to investigate “supernatural phenomena”. One night after a fight with Erica, Angie goes missing, never to be found. Over a year passes since Angie’s disappearance and Erica finds herself about to enter the mysterious mansion in town, hoping to finally get some answers regarding this spooky old house and her missing friend. Featuring some stellar visuals and lighting effects, not to mention voice-work, Til Morning’s Light is a adventure/horror/puzzle and exploration game with some gesture-based fighting mechanics. Players help Ericaexplore the large creepy, specter-filled mansion, discovering clues to the secrets it holds inside and keys to unlock additional rooms and areas to explore. Along the way Erica will have to fight off ghosts and other creatures by performing tap and swipe-based challenges where timing is everything. Til Morning’s Light offers a polished and engaging experience; Amazon Game Studios is certainly making quite an initial splash on mobile. I highly recommend listening to the (optional) free short 30 min prequel audiobook, Til Morning’s Light: The Private Blog of Erica Page. While not required, it does do a nice job of setting up the back-story for the game and it is well narrated. And that’s all I have for you this week, I hope you all have a great long weekend.